These operations were run by the Pure project, which has been running for the last ten years. 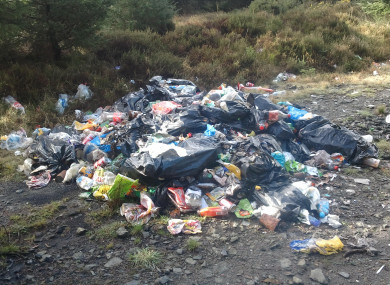 LOCAL AUTHORITIES RESPONSIBLE for the Wicklow and Dublin uplands are expected to pursue litter fines and prosecutions for illegal dumping this year after CCTV operations to catch offenders. These operations were run by the Pure project, which has been running for the last ten years. It involves groups who agree to ‘adopt’ a mile of local road and commit to keeping it clear of waste. Last year more than 50 groups adopted over 150 miles of road, including some upland areas. Since 2007, when the project began, there has been a 45% reduction in illegal dumping in the Wicklow/Dublin uplands. The Pure truck is on the road every single day and has collected over 3,000 tonnes of rubbish from over 10,000 illegal dumping sites. If all of this rubbish was placed into standard household rubbish bags, it would fill over 400,000 bags. “Yes, we have reduced it, but there are still 200 tonnes out there so now is not the time to be complacent because we don’t want it to go back to the bad days,” manager of the Pure project Ian Davis told TheJournal.ie. One of the approaches the project has used is these covert CCTV operations at several upland sites. “We’re working on it and we’re determined. What’s interesting is now we have footage to show who is responsible,” he said. “The CCTV footage clearly identifies people involved in both littering and illegal dumping and provides us with evidence for who is responsible for these activities. We have footage of people driving to remote upland locations in the middle of the night and throwing out bags of rubbish from their boot. People in the broad day light emptying the contents of their car boot at woodland entrance. Others dumping van loads of green waste, and we also have footage of larger scale illegal dumping, which we hope will lead to waste management prosecutions. He said he had met just this week with Wicklow County Council, which he said was fully behind the project. Pure has helped secure litter fines up to now and he said it is now pursuing fines for environmental pollution, which involves larger volumes of waste than smalltime littering. By the end of this year, he said the hope Pure’s work will result in around ten cases, including litter fines and environmental waste penalties which can result in a €3,000 fine and a prosecution. Email “Prosecutions for illegal dumping expected after covert CCTV operations in Wicklow and Dublin”. Feedback on “Prosecutions for illegal dumping expected after covert CCTV operations in Wicklow and Dublin”.